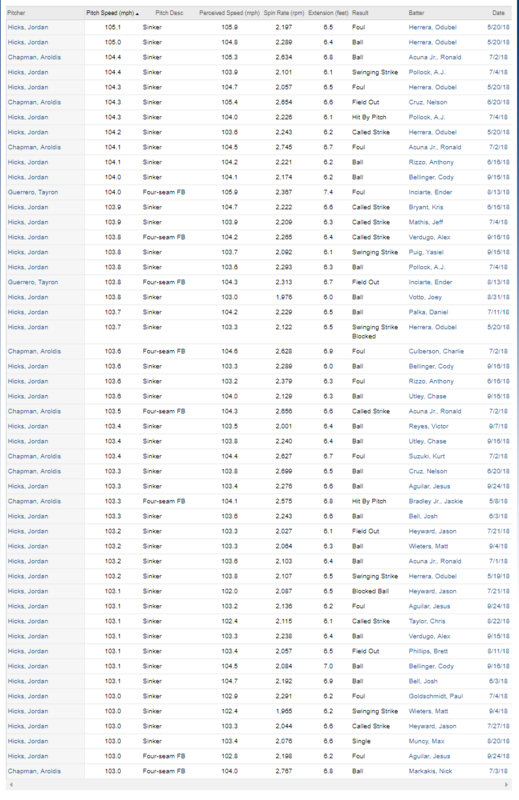 I know that he has the record for the fastest pitch ever, but there is an hilarious stat that I found (but now cannot find again) once showing the 20 or so fastest pitches since 2000. I think Chapman had all but 2. Has there ever been another pitcher who was this much ahead of the rest of the league? In other words, has there been a pitcher who's fastball was so consistently much faster than anyone else's? During the 2018 MLB season, Jordan Hicks had the two fastest pitches recorded at 105.1 and 105.0 mph. Outside of several Chapman pitches and two pitches by Tayron Guerrero, Jordan Hicks dominated the first page of results of MLB Statcast's list of fastest pitches.